WITH “EMBEDDED MEDIA,” you and I get satellite videophone images from reporters diving from the whirl and boom of rocket-propelled grenades and ducking the whistle of small-arms fire. We witness up-close, split-second decisions about life and death under the rubrics of “rules of engagement,” “casualty collection” and other military jargon. Our nation and the world are witness to a war, which brings us close to the life and actions of U.S. soldiers. I am writing as a pastor, a patriotic American, and the chief of chaplains for the U.S. Army. 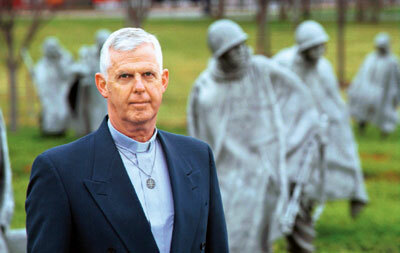 Presently, more than 480 chaplains and 270 chaplain assistants are deployed in the Iraq war zone. They stand beside our soldiers as noncombatants representing hope grounded in faith. Even amidst the differences in our society and around the world about whether or not to use military force, soldiers fulfill their duty by offering their loyal service on behalf of the nation. The chaplains are present not to simply “add grace to the enterprise of kings and princes” (Reinhold Neihbur), but chaplains are called to bear witness to another reality. On a practical and immediate level, chaplains lead worship, offer counseling and guidance, and provide advice to Army leaders about the ethics, morals and morale of soldiers. For me, this is a mantle of priestly, pastoral and prophetic responsibility. I have committed 37 years to ordained ministry as a Lutheran pastor and as an Army chaplain. I have been blessed by serving with soldiers and their leaders as they bear the burden of combat and, like all of us, seek to give to the nation and to the world a legacy of liberty, justice and peace. Personally, I inherited the mantle of priestly, pastoral and prophetic roles from my father, who served as a World War II chaplain. I wear a mantle of responsibility when I wear the black and gold Army chaplain’s stole that my dad used a generation ago and that he presented to me. Decisions about the use of military force are rightfully the subject of prayerful deliberation in our churches, while the authority of the decisions rests with our legitimately elected civilian leadership. Soldiers carry out these decisions and, since 1775, chaplains bear witness to eternity among our men and women in uniform. The soldier and chaplain are each unique callings fulfilled by those who respond to the call of the nation and to the call of God. Even in the midst of the violence, fog and friction of war, we look to the source of our hope and strength. In fact, especially in the midst of armed conflict, soldiers and chaplains join the nation and the whole world in seeking the guidance of God. For all the pluses and minuses of the continuous, live reporting of this war from the forward edge of the battle space, we can see the courage, self-discipline, confidence, commitment and determination of soldiers. The embedded reporters describe and broadcast what they see. And I see the influence of the embedded chaplains, who contribute to the character of our soldiers as they extend their caring to young men and women who might not have the witness of faith without these clergy in uniform. I covet your prayers for peace and for the guardians of peace, our soldiers on point for the nation. Chaplain (Major General) G.T. Gunhus, chief of chaplains for the U.S. Army, is responsible for the oversight of more than 2,300 active duty, National Guard and reserve chaplains worldwide. During the war with Iraq, he has provided guidance and policy for ministry to soldiers in combat. ?is includes assigning chaplains to accompany officers to notify the families of soldiers killed in action, wounded, missing in action or held as prisoners of war — and to minister to those families in the aftermath. He attends the daily Operations and Intelligence updates with senior Army leadership at the Pentagon and ends each briefing with prayer. Since the war began, he has been on duty seven days a week, and expects to remain so for several months to come. A member of the Seattle Pacific Class of 1962, Gunhus was named the University’s Alumnus of the Year in 2001 for his service to countless American soldiers in nearly four decades of service.